All of our lives are a journey … a journey from somewhere to somewhere. Perhaps your life has been a journey away from abuse toward emotional and physical health. 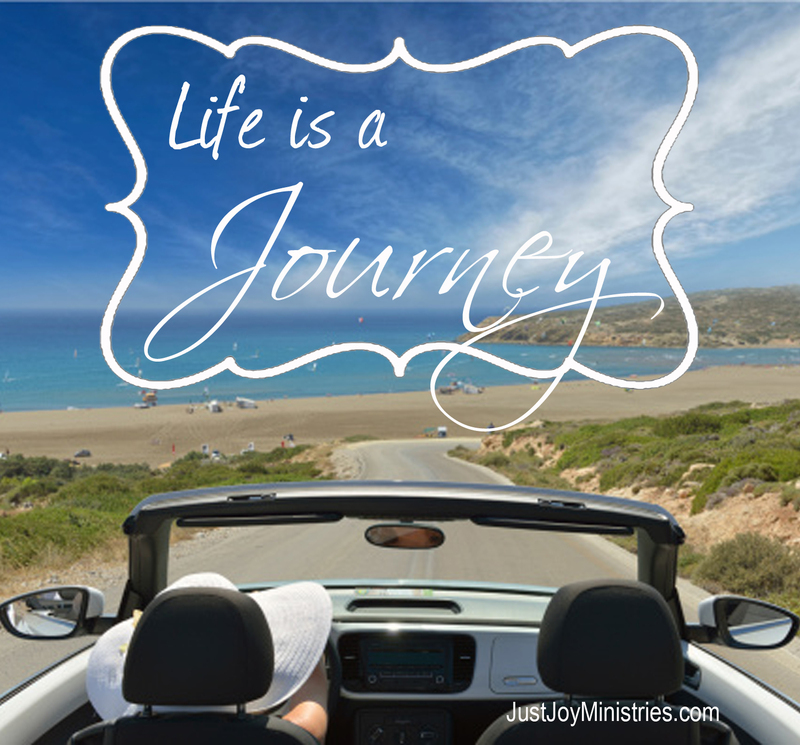 Maybe your life’s journey has encompassed education, travel, and scintillating relationships. Did you start life as a victim in a dysfunctional family and now you are proud to say that you have built a victorious family of function and faith? My life’s journey has often lingered in the land of depression but I can confidently say, now, that joy is my home address! In the fifth grade, my beloved teacher, Miss Sullivan, taught her curious class of eleven-year-olds, that in defining a certain word, one should never use the word itself in the definition. The rule Miss Sullivan taught all of her eager learners is an accepted grammatical rule that most savvy writers and wordsmiths follow implicitly. However, I have discovered, it is nearly impossible to define the word “joy” without using the word itself in the definition. Due to my frustration at being a grammar elitist and knowing that substance is lacking by using a word in its own definition, I decided to dig deeper and valiantly endeavor to find the root definition of the word “joy”. “Joy wrought by the Holy Spirit” was a definition that resonated a bit stronger in my frustrated soul because at least it gave some credit to the Holy Spirit. Although this definition uses a derivative of joy in the word “enjoys”, I found myself completely agreeing with this ancient meaning found among stacks of dusty, dog-eared books. 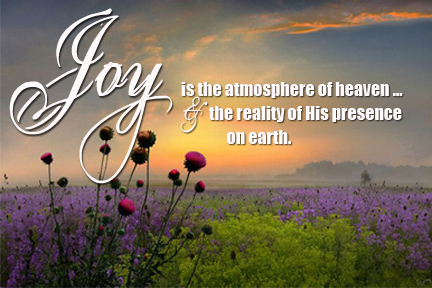 Joy is the atmosphere of Heaven. It is the air God the Father himself breathes in every day of eternity. And because joy is Heaven’s delivered gift to me while I walk on planet Earth, it is my delight and strength to experience the blessedness that God on His throne enjoys. Wow … put that in your heart and marinate in it! Joy is God’s gift to us as we snuggle into His presence and hunker down into all that He is and all that He gives. Have you ever been invited to dinner at a dear friend or family member’s home and then been forced to sit and watch hours of family, vacation and holiday videos? Well … consider yourself invited over to dinner at my life because I, too, am going to force you to view my journey to joy! Today … welcome to scenic view # 2! “Do not be grieved [or depressed] for the joy of the Lord is your strength” (Nehemiah 8:10). You have an enemy who desires that you would live in a constant state of debilitating, relentless depression and discouragement. This enemy is unable to change the fact that you are Heaven-bound and have been guaranteed eternal life. He can do absolutely nothing about your entrance into Heaven’s gates. Since he can’t touch eternal life, what he attempts to do is to ruin abundant life. Don’t let him do it! You have a God who wants to inject you with His joy because it is God’s miraculous, perpetual joy that will deliver strength to your life this side of heaven’s glory. The devil does not want you strong. This diabolical laughing stock of a shadow of absolute nothingness wants you to be the weakest version of yourself possible and so he goes about it in one singular way: the devil attempts to steal your joy. The devil is not after your marriage, your health, your finances, your children, or your relationships. What He is after is your joy and the way that he tries to access your joy is through your marriage, your health, your finances, your children, and your relationships. If you release any of your joy to the enemy it will turn you into a weak, whining, and ineffective Christian because the joy of the Lord is your strength. Other than your salvation, I believe that your joy is the most valuable commodity you have been given while walking the surface of planet earth and sucking in oxygen. The powerful gift of joy is able to give you indomitable strength during your days of pain and trauma. If there is anything the devil hates more than a Christian … it is a joyful Christian. 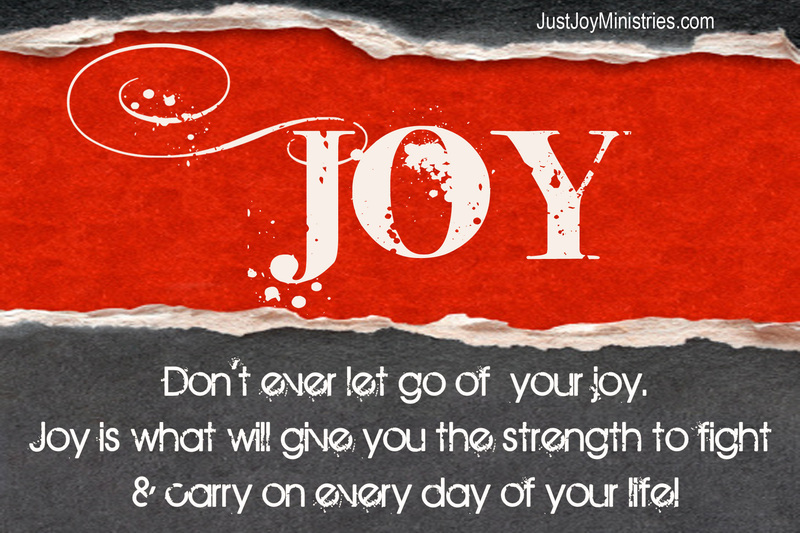 Hang onto your joy. Don’t ever let go of your joy because joy is what will give you the strength to fight and to carry on every day of your life! This is just what I needed to hear today. I was so angry, I could hardly focus on the words. Now, I know why. The enemy was trying to steal my joy! Bless you, Mary. Don’t you just love it when God is doing a great inside work on you? I am praying for you today! I loved this so very much. I noticed myself grinning ear-to-ear and shaking my head up and down as I read it. That joy, that precious, beautiful, wonderful joy is what drives me daily. I get drunk on it. It’s the lifter of my head. Love it! And love this post toting it’s awesomeness. Be blessed! Bless you, Marge. Thanks for sharing your heart with me. I will be praying for you. Bless you, Brie. Thanks for your words of encouragement. Isn’t God good?!! Day after day, I let the devil steal my joy by worrying about bills, money, the essentials to life here on earth, but I need to let it go and let God take charge of those things of those things so I can fill myself with His JOY. I am so full of Joy and I thank The Lord for his blessing! I wake up every day to constant phone calls from the mortgage company and other various bill collectors. I presently have no income, we live off of my husbands small SSR check and have 2 mortgages. We do receive food stamps, but also have many other bills. I had a wonderful job for 16 years, making okay money and paid health benefits. I no longer have health insurance and need medical attention, I see a therapist and psychiatrist at a free clinic, which does not offer general health care. I am awaiting for a decision on SS disability, because at this point, I am so stressed out, I feel I cannot hold a job. My point is I let this eat up most of my waking time. I try to sleep as much as I can to turn off my mind and thoughts. I do pray and I will keep you in my thoughts, you are not alone. I personally know what it feels like. Please pray for me also. Praying for you, dear Linda. Hang in there. Thank you Carol. it means more than you know. I love reading your material. Beth – I am praying for you today! I woke up with the words, “Joyful, joyful we adore Thee!” going through my heart and head. It’s a wonderful day to serve the Lord and be filled with the joy of His presence. I am praying for your husband. Yay!! I love it, Beth!! !